Brazilians buy their food at open markets, supermarkets, small markets, and convenience stores. Most locations are clean and safe, but fruit and vegetables should always be washed before eating. For a larger shopping expedition, the supermarket or open market is best. Prices vary between locations. Supermarkets sell all cooking, kitchen, and bathroom supplies (fresh food, canned/packed food goods, soaps, and toilet paper), and are often found in malls. 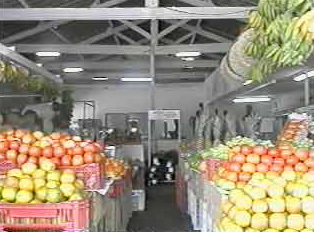 Open markets are recommended for meat, cheese, fruits and vegetables. In the south of Brazil, an open market may be called "the public market." Small markets are located in neighborhoods and sell items in small quantities. Convenience stores are usually found at gas stations and are best for quick purchases.